Image: Llorens-Bobadilla, Enric, et al. The three-pound lump under our skulls that allows us to speak, run and function in our daily lives is a mass of dozens of types of minuscule cells joined in an intricate web of communication. We pop out of the womb with our brains ready for us to interact with the world, but throughout our lives, new cells are born and others die, connections form and wither. There is a group of cells that makes this possible. They are our brain’s store of stem cells, which can become all of the different types of cells of the brain, including neurons and glial cells. The brain’s stash of stem cells is important for both maintenance and healing after injury. Some of them become neurons, others glial cells, and some remain as the trusty store of stem cells. When cells change from the stem cell version to a specific type of cell, this is called activation (in scientist lingo). Ana Martin-Villalba and her team of researchers at the German Cancer Research Center wanted to know what makes a stem cell change from the dormant state to this activated one. They looked at the SVZ (subventricular zone), which is a part of the brain with a hub of stem cells. Using human cells, they looked at the genes expressed in individual cells. Let that one sink in. We can study the genetics of separate cells, and taken together look at the gene expression of whole groups of cells. Based on the gene expression, they distinguished two groups, quiescent and active. The quiescent cells were broken down further into dormant and primed cells, which are ready to become active. The researchers then compared the dormant and active cells, to see how they acted differently. They found that the active cells were churning out proteins, the molecules that cells use to function and communicate, and were busy specifying more into specific cell types (a process known as differentiation). This month’s image looks like a mosaic with each tile representing a single gene in a single stem cell. The cells in this grid were undergoing a simulated stroke, receiving decreased blood flow and oxygen. Simulating this physiological perturbation and examining the response of the stem cells showed that just as there are subsets of cells under normal conditions, subsets of cells respond differently under injury. Not only that, the response showed activation. This study solves a piece of the puzzle of how the cells are being stimulated to become active. A molecule called interferon gamma helps orchestrate the transition. Understanding the stem cells in our brain can have important implications for helping our brains heal after brain injury or in neurodegenerative disorders. Llorens-Bobadilla, Enric, et al. 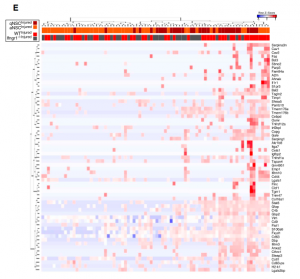 "Single-Cell Transcriptomics Reveals a Population of Dormant Neural Stem Cells that Become Activated upon Brain Injury." Cell Stem Cell 17.3 (2015): 329-340.